I’ve been struggling with social anxiety for as long as I can remember. Whilst I am getting better at going out & socialising my anxiety still holds me back. Recently I contacted my local community project to get involved. I figured I may be able to help spread the word about events & fundraising and maybe get to meet a few more people locally. Feeling brave I typed out a message & hit enter. I got a reply and we organised meeting up for a chat. Izzy fell ill and I missed meeting the guy who runs the project. I contacted him to apologise and agreed to rearrange. My anxiety is preventing me from messaging again though. I’m just a small blogger who writes to pass the time especially when I’m in pain. How could I actually help? I was also invited to the community house meetings which are on a Thursday evening. Of course I let everything get in the way so I was ‘too busy’ to go. This has annoyed me. I’m preventing myself from moving forward with the blog & getting to know more people in the community. Why? Because I’m scared. I’ve always been the weirdo’s kid, the outcast and I still feel that’s how people see me. Whilst my confidence has grown in some areas my personal confidence is still struggling. I know I can offer something to the community, I’m doing well with the blog but I don’t have the confidence I need to get that across. Getting to know people locally could be nice but at the same time I quite like being unnoticed. I guess I am a bit of a loner. Realistically though I need to get out more, I need to meet more people, I need to have more confidence in myself and start getting involved more in the local community. I’m determined to work on this but I know it’s going to be tough. I feel perhaps looking at online therapy may be helpful rather than face to face. Do you have social anxiety? Do you have any confidence building tips? 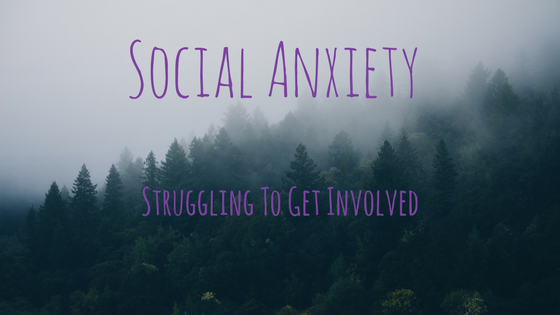 Has getting involved in a community project helped you overcome social anxiety? I suffer with it too, I get these great ideas - like you did - and then when it comes to it I just want to get out of it somehow in a panic.No idea how to deal with it at all I've been like it for years sadly. It's so frustrating. I'll try faking it more! I don't have social anxiety, but other forms of anxiety unfortunately. It is such a hard battle, but it can be managed. (I doubt it can be overcome, but nicely managed). I use my blog as well as a creative outlet and to connect with fellow bloggers. Good luck to you!